You may have noticed that it has been very Truffly around the facebook and G+ pages these days. Not chocolate truffly, but full-on Perigord truffly. 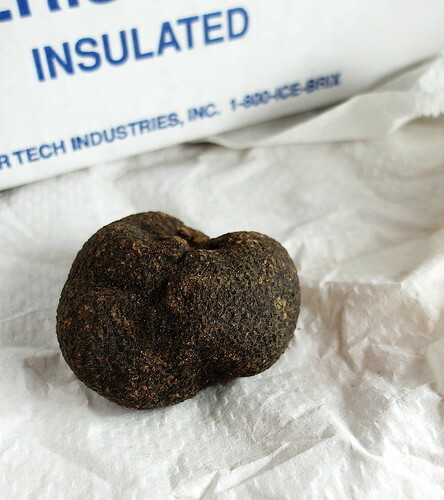 I was fortunate enough (and trust me, they are probably tired of all my thank yous by now) to win a Perigord Truffle from Gourmet Attitude through the wonderful duo of Denise and Lenny at ChezUs. Okay, one more thank you, you guys! Just look at him. He is beautiful, in a Brown and Humble sort of way. Up until Mr Truffle arrived, I had never worked with fresh truffles. Not even frozen truffles. I wasn’t quite sure what to do with him, but I knew that I wanted to show him off in the best possible light. So I consulted the Oracle at Google and asked what to do with him. This is what I found. Roger that; they were speaking my language. I have never met a starch I didn’t love. To date in Truffle-Palooza, I’ve made mashed potatoes the leftovers of which morphed into potato pancakes a couple of days later. I’ve made white pepper and black truffle pasta which I then turned into a Truffled Carbonara. Even as we speak, I’ve got pizza dough in resting in the fridge for Truffle Pizza tonight. 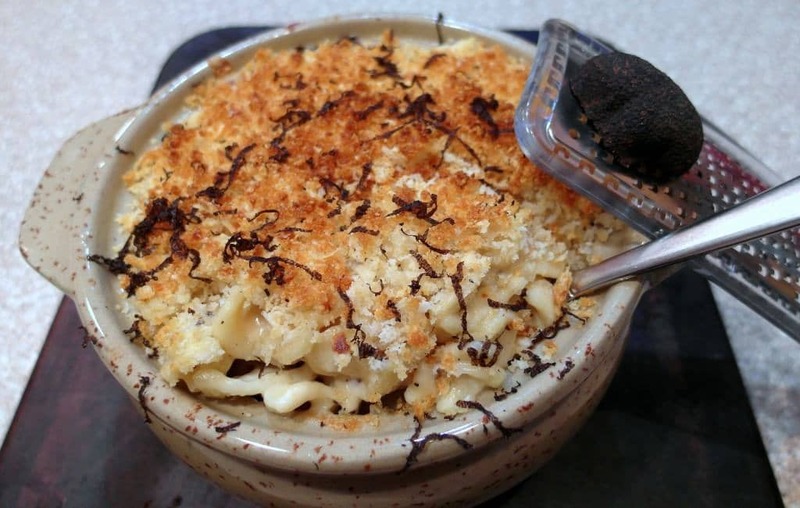 I want to share with you the truffle mac and cheese, though. I know it has been done to death in restaurants and that it is usually made with truffle oil as opposed to Actual Truffles. Would you like to know why so many restaurants make this stuff? Because it is Really, Incredibly Tasty. Now, since this is Truffle-Palooza and not a Staid Recipe Development Laboratory, I don’t really have firm measurements to give you. But that’s okay; you’ll be fine. I just know it. Take my idea, or the parts of it you like, and make your own version. If you want to get pretty close to what I made, I will give measurements, but please understand that they are Approximate. With a dish like this, I think the most important part is the technique anyway. Rich, creamy, filling, decadent and perfumed with Mr. Truffle. I am serious when I tell you that it doesn't get much better than this! Cook the pasta to al dente. Drain well. 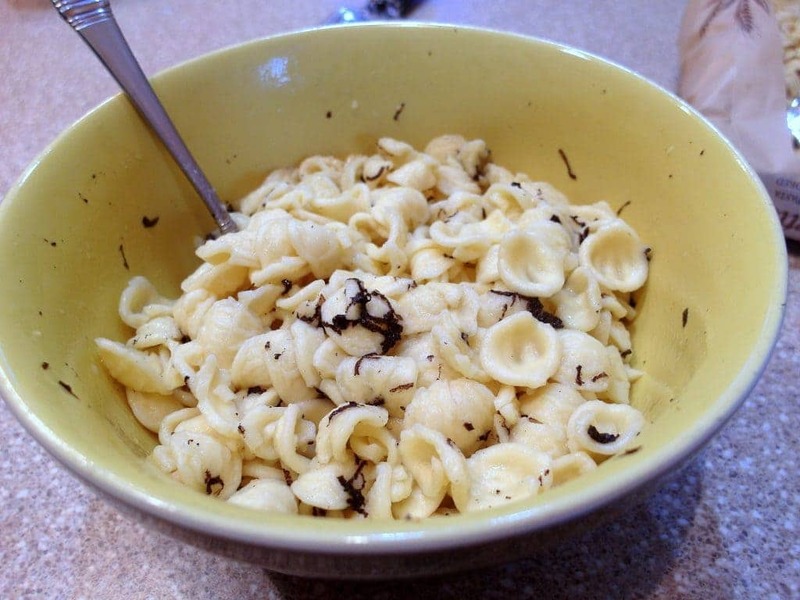 In a bowl, gently but thoroughly stir together the pasta, oil and microplaned truffle. Set aside. Cook the onion along with a pinch of salt and pepper in 2 Tablespoons of reserved bacon fat until soft. Add 2 Tablespoons of flour and cook, stirring constantly, for about 2 minutes. Pour in the two cups of milk along with another pinch of salt and pepper. Bring to a boil and the reduce the heat. Let the sauce simmer for maybe 5 minutes. Off the heat, stir in the cheeses, a bit at a time, until the sauce is nice and smooth. You may have to briefly put it back over the heat to melt all the cheese, but don't let it even come close to a boil or your sauce could break. Taste the sauce and season with more salt and pepper if necessary. Gently but thoroughly stir the sauce together with the pasta. 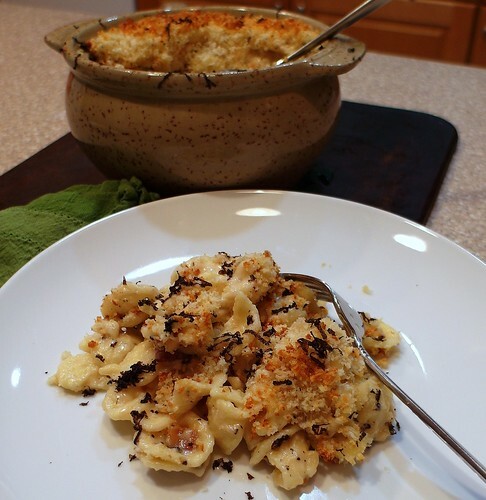 Put your mac and cheese into a small casserole dish and top with the panko mixture. Bake at 375 for about 45 minutes. If necessary, broil for a couple of minutes at the end of cooking, just to get a lovely color on the topping. Serve, shaving additional truffle on each serving. Mix the panko, cheeses, salt and pepper together in a small bowl. Drizzle in about 1 Tablespoon of bacon fat and stir well. And there you have it. As I said earlier, the measurements are approximate. Feel free to use whatever cheese you have on hand. I bet a gruyere would be phenomenal with the truffles. You can absolutely leave out the bacon and just use butter or olive oil, but I will say that making the roux with the bacon fat imparts a subtle smokiness to the whole dish that is kind of irresistible. You are welcome to try to resist, but I wouldn’t recommend it. 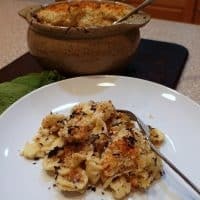 I do hope you give this version of mac and cheese a spin. Even without the truffles, it’s delightful! OK, if I don’t have the truffle (and I won’t) what would I sub or can I just play like I have it??? You can certainly just pretend like you have it or if you want some intensely mushroomy goodness, mince in some dried wild mushrooms into the cream sauce. And/or get your hands on some truffle oil and or truffle salt like Susan mentioned above, @twitter-221596716:disqus ! Most excellent indeed! Only if I could get my hands on a truffle! Guess some truffle salt and oil will have to do! You can absolutely use truffle oil, @google-5ced5c7782098de92af133b3f4514fe1:disqus . Toss the pasta with some before combining w/the sauce and then drizzle a little over each serving. Yum! Please, please, please, please, please, please move back to Florida! You just took mac and cheese and bounced it out of the stratosphere!! I totally blame Denise and Lenny for my free truffle! I had the best time using that little guy. 🙂 And as much as I love you, and I love you a bunch, I will (hopefully) never move back to Florida. You should come visit!! NC is kind of awesome.